Advantages: Great wartime footage, including color sequences; terrific inspiration for modellers. The B-24 was produced in greater numbers than any other US combat aircraft. Yet despite this fact the Liberator is often over looked. This DVD is a tribute to the B-24 and the crews that flew them. This DVD was made after the war as a testament to the tenacity of the crews and the ruggedness of the aircraft. The first documentary shows various B-24s bombing Ploesti and the homeward journey of Boomerang, a B-24 equivalent of the Memphis Belle. It is real neat to see a B-24 doing a low level pass. There is plenty of nose art, which will be a motivation for modelers. Both the B-24D and J are shown to great effect. Formation shots and combat are highlights in the beginning of the documentary. One thing that I noticed was that the B-24 does not fly the close formation that the B-17 did. Was this the reason that the Luftwaffe liked to attack the Liberators instead of the B-17 or was it just the B-24s were easier to shoot down? There are plenty of B-24s to choose from, both natural metal finish and OD/NG aircraft. There are plenty of strike videos, some real and some that look like studio models. If you want to try something different there is video of cargo being loaded and dropped to the troops crossing the Rhine. There is some great crash videos included that to me are dramatic to say the least. The next section is an Air Force documentary called “Ploesti” and recalls a raid in 1944. This is not the low level raid that is associated with the B-24 but a later high altitude raid. The B-24 is shown to good effect but the low level flying by the P-38s is impressive. There is some impressive gun camera footage that I hadn’t seen before. Operation Reunion, the return of the POWs from the Rumanian camps, is also shown. A short color sequence of the Ploesti bombing follows. While short, it is intense in the fires and low level flying, but very brief. Operation Titanic is the next documentary to be shown. For those of you who are unfamiliar with Operation Titanic, it was the shuttle missions flown from England to Russia and back. Conveniently the documentary fails to mention the Ju-88 that trailed them to there landing area or the bombing that destroyed a number of bombers and fighters. There is a lot of flying stuff, as well as, the USO show or whatever the Russian equivalent is. It doesn’t look like anyone is tense at least that is the way they wanted you to see it. There is footage of the Yak-9 and P-51s together on the airfield, quite a contrast to the Korean War. The next part of the video is an AAF report from Hap Arnold and tells how the Army Air Force trained and manned the force that would eventually win the war. It shows the breakdown of the USAAF and the various commands. The highlight are the various aircraft shown in combat, such as A-20, P-38s, B-17s, C-47s, Hudsons, Beaufighters and B-24s. The film of the B-25s at low level and with the big 75mm gun is impressive and inspirational. Bring out those Accurate Miniature B-25Gs. There are some great video from the German point of view. Also there are some really nice shots of the Flying Tigers. The entire air force around the world is covered. The rhetoric is typical WWII propaganda, work hard and we’ll win the war, but the video makes it worthwhile. 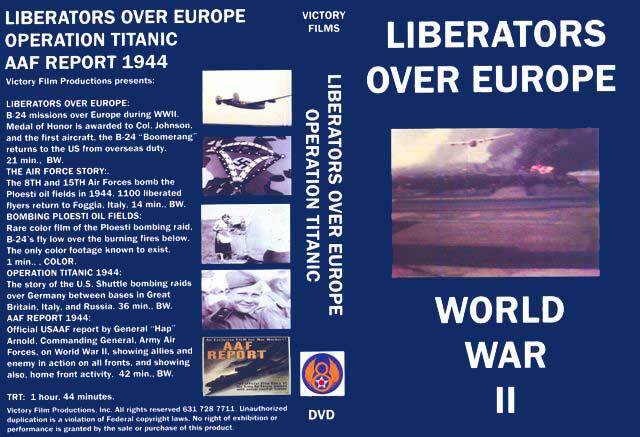 This DVD is typical of the quality historical video I’ve come to expect from Victory Films. They present a unique war time view of the conflict.